← Who belongs on Cockatoo Island? We visited several art museums and exhibitions during our days in Sydney. 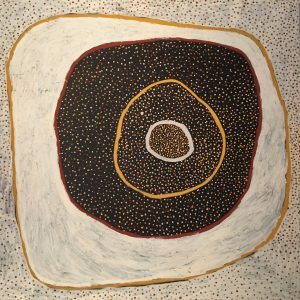 The collections provide a fascinating record of how artists have constructed the images of Australia over time to reflect their shifting sense of identity and the conflicts and concerns of the moment. At the Art Gallery of New South Wales we saw a diverse collection, including numerous European works from across the centuries—a guide proudly pointed us toward one painting each by Cezanne and Monet, for example—as well as works by white Australians and indigenous artists, the latter of whom were especially featured in contemporary collections. 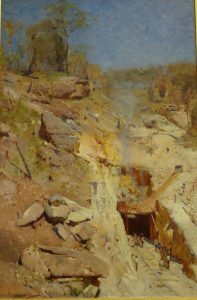 Streeton documents an important phase of Australia’s development as a nation in the latter part of the nineteenth century, with the building of the railroad across the Blue Mountains west of Sydney. 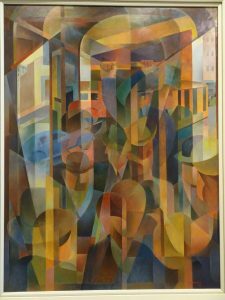 “Fire’s On,” the warning call when a blast goes off, depicts the response to the death of a worker, where the human activity is dwarfed by the vast and treacherous landscape and the sense of dry heat and harsh light. 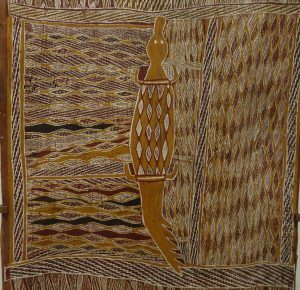 We also saw numerous works by Aboriginal artists, including a room centering on a massive display of carved tree trunks which were surrounded by exquisite bark paintings, including, for example, “Lany’tjung story” (“Crocodile bandicoot, Fire dreaming”) by Munggurrawuy Yunupingu (1959), seen here in detail. The art we saw also, however, exposed the painful, ineradicable effects of settler colonialism on Australia’s indigenous peoples. In a four channel video installation, “tall man 2010,” by Vernon Ah Kee, for example, four juxtaposed screens show real-time footage of a violent escalation of racial tensions when the Aboriginal residents of Palm Island, a small village in Queensland, learned the autopsy results of an indigenous man who died in police custody. 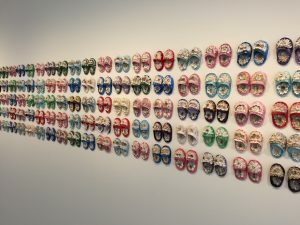 In a different vein, Esme Timbery, an artist from a Sydney suburb, employs in “Shellworked Slippers” (2008) a traditional craft of shellwork to create two hundred pairs of empty, child-sized slippers. 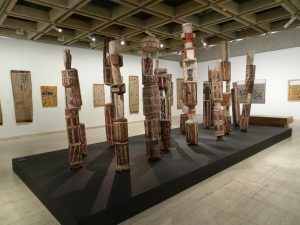 The installation memorializes the suffering of Aboriginal people under government policies that caused dispossession and disadvantage, linking the long-established craft to the changing realities of the contemporary city. The riveting, deeply disturbing stories and images seem all too familiar—another way in which we find our histories crossing vast borders.